Kids parties have become the latest craze, and coming up with unique and fun themes and activities for children’s birthday parties and other events can be daunting. More and more parents are faced with the need to find new and creative ways to entertain throngs of classmates, neighborhood friends, and siblings of various ages. One simple, low-cost, and very popular way to entertain children at any kind of celebration or gathering, indoors or out, is with a good old-fashioned treasure hunt. A treasure hunt is the one party game that truly promotes interaction, naturally evokes squeals of excitement, and leaves your party guests with lasting memories of their adventurous day at your child’s party. 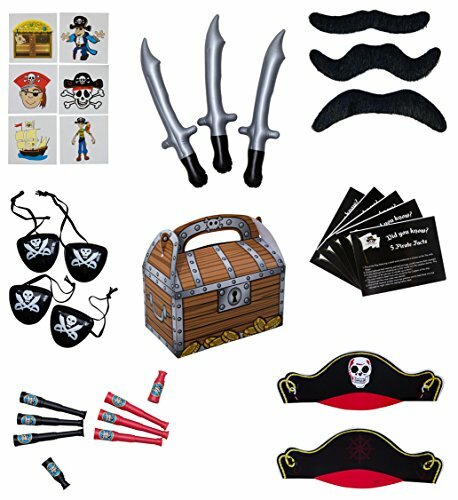 What if your child doesn’t want a pirate-themed party? No problem! Treasure hunts aren’t just for pirates. Tradition has dictated that pirates are the great treasure hunters, but the fact of the matter is treasure hunts are loved by boys, girls, and grown-ups alike, and make a great addition to any party theme. Treasure hunts can be simply adapted with a story-line and a variety of decorations to fit into any party theme. This is the one area of planning where your child might already have a very clear idea of what they would like, and it would be wise to involve them in this decision, as it makes the party their own. To adapt a treasure hunt for a princess-themed party, for example, you might announce that someone has stolen the princess’s jewels, and whoever finds them by following the clues will be rewarded with a share of the loot. You place a jewelry box overflowing with plastic beads, candy necklaces and rings, and other gem-like treats in the center of the party table, and have someone sneak the treasure away during the party before making the announcement. Other themes and decorations might revolve around the latest TV cartoon characters, superheroes, pop idols, a holiday, or your child might want to create their own theme. That being said, be careful not to fall into the parent trap of spending a small fortune buying themed party goods. Consider purchasing just a few themed bright and colorful decorations and/or centerpieces, and then either complement them with less expensive coordinating party supplies and decorations, or make your own — there are plenty of great fun ways to put you and your child’s artistic talent to work to customize your party. Some crafty ideas kids may love making or having at their party include authentic-looking weathered pirate treasure maps, princess crowns and jewelry, spyglasses made from paper towel rolls, pinatas (handmade or bought), cardboard hooks inserted into the bottom of Styrofoam cups to wear on their hands like Captain Hook, paper or felt decorated pirate hats, and bejeweled and personalized loot bags, to name only a few. Although it requires some time, creativity, and resources, you can make and stage your own treasure hunt game to play as a group or competitively in teams. Design and hide 10 level clues that lead players step-by-step from one clue to the next, hidden among common objects, to ultimately discover the hidden treasure, which might be sacks of loot consisting of candy such as chocolate coins wrapped in gold foil, or party favors, toys, and other items valuable to children. Alternatively, if you’re short on time, money, and party ideas like many busy parents and party planners, online sites such as Treasure-Adventure.com offer affordable complete treasure hunts with pre-made custom clues full of rhymes and riddles that kids love to solve, the design of which can be the most time-consuming and difficult part of preparing a treasure hunt. Use creativity to build your party further around the hunt for a truly fantastic and memorable party that your child and his or her guests will talk about long after the party is over. Although the treasure hunt will likely be the main attraction since it is the most action-packed and engaging, don’t necessarily limit other activities that might complement the hunt such as a cannonball toss using bean bags or water balloons, “Walk the Plank” using a shallow pool full of plastic alligators and snakes, pan for gold using gold spray-painted rock nuggets, dress in costumes, hold a peg-leg relay, make a castle or pirate ship out of an appliance box, play “Blackbeard says,” etc. — the sky is the limit! Treasure hunts are also not just limited to children or birthday parties, but are perfect for family fun night, slumber parties, classroom parties, picnics, and other group events. Treasure hunts bring parties alive with hours of challenging and fun entertainment, with the thrill of the hunt along with the solving of puzzles often being the most enjoyable and memorable part of the day. And don’t think you can’t top your last party. By using a variety of themes, new treasure hunt clues and decorations, and a little creativity, you can throw many more successful and unique parties for years to come that never go out of style. If you’re up to the challenge, spyglass and compass in hand, yer prize is in sight, so let the adventure begin!